I honestly have not paid too much attention to the comics involving The Jim Henson Company. I guess I always associated them with the Muppets and therefore failed to engage with them. How wrong I was. 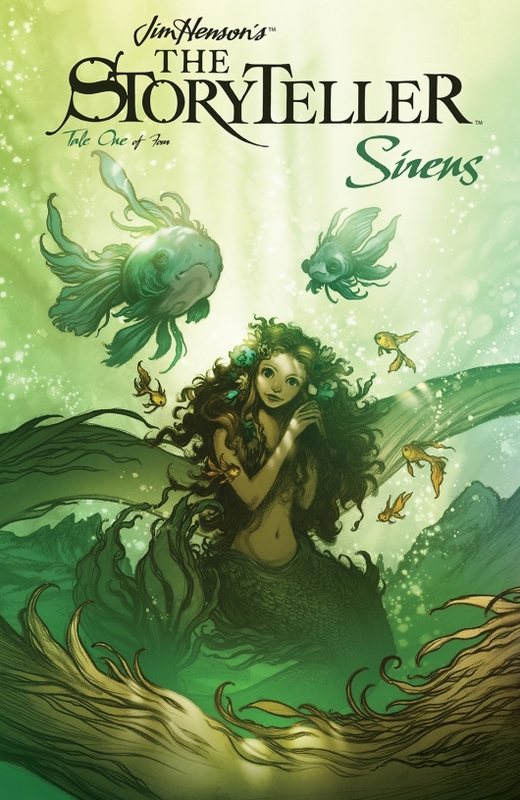 Jim Henson’s The StoryTeller: Sirens #1 is produced by Archaia Entertainment and is actually related to the television series of the same name from the eighties. I actually do not remember the show but I was seventeen when it started so that probably explains it; I was always busy back then. 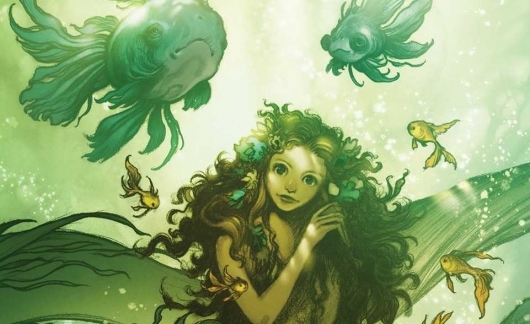 In this first of four tales, “The Mermaid and the Fisherman,” we find ourselves following the life of a successful fisherman. He has a dream, perhaps even an obsession, of having more. No matter what his achievement, he longs for it to be greater. This drive, this hunger drives him to work harder and distance him from his loving wife and daughter. His quest eventually causes him to capture a mermaid and force her to make him happy through her enchanting singing. Oftentimes the song of the mermaid caused sailors to wreck their ships, but in this case, it is his life that is destroyed. Returning home after a long time away, the fisherman finds his family gone. Realizing his folly, he seeks to find them and his happiness once again through travel, adventure, and even endangering his life. But, in the end, he discovers that not all of life’s greatest treasures and pleasures are found elsewhere. Sometimes, you just have to be willing to open your eyes to what you already have. Bartosz Sztybor tells us a story with a moral; and the way it is related from the storyteller to his faithful hound is a throwback to the original television program, complete with some fantastic and ominous art from Jakub Rebelka. Additionally, this back and forth concept of the man and dog having a conversation about the story gives the reader the ability to see how the tale reflects itself in their own life and how they can find solace and peace without needing more. I will be finding the other comics in this StoryTeller series, now that I have opened my eyes and found a treasure I had previously overlooked. It seems quite fitting that it took this story to teach me that same lesson.